Coming from an Anglophone family with no French background, Caroline’s family welcomed the idea of a school that encouraged multiculturalism and bilingual immersion. 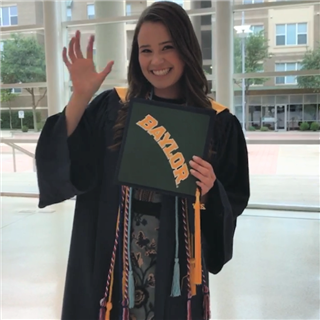 Caroline continued her journey with DIS through middle and high school, then leading her to Baylor University which she currently attends. Looking back, Caroline shares that DIS played a part in her future career goals of working as an ambassador to a French speaking country or working in foreign service. Being a stellar student and extremely involved on campus throughout her time with DIS, Caroline took full advantage of the multitude of activities available on campus, from swimming, volleyball, organizing her class prom, to even studying abroad twice, once to China with her DIS Mandarin class, and also to Florence, Italy with the school. When asked what she would share with current DIS students, Caroline explains the importance of involvement on campus, saying, “Take advantage of what’s offered. You can start so many things at DIS that you can take with you, as you grow and move on in life.” Caroline has capitalized off this philosophy, now majoring in French, planning her next adventure studying abroad in Aix-en-Provence, lifeguarding and tutoring student athletes in both Math and French at Baylor University. Describing the benefits of a rigorous bilingual French/English immersion curriculum and how they have further affected her life after DIS, Caroline shares that it was because of the study and test taking habits she picked up through the FB track, her freshman year at Baylor was less stressful and anxiety-filled than her peers. Caroline was able to test out of her freshman level French courses due to meeting the requirements from her years at DIS, and even able to teach her dorm roommate how to prepare for exams. Caroline realized the advantage she possessed coming into Baylor when her roommate shared how she had no idea how to review course information prior to the first exam. Caroline was able instill the preparation and prioritization habits picked up during her final year at DIS with her roommate. When discussing her future, Caroline’s face brims with enthusiasm as she discusses how, in the next five to ten years, she plans to graduate from Baylor, attend law school, work toward completing her foreign service exam and move abroad as a foreign service officer. Equipped with everything she needs to see all of her dreams come to fruition, we will continue to watch Caroline flourish and represent the very best of DIS. We wish her well and look forward to seeing what the future has in store for Caroline!